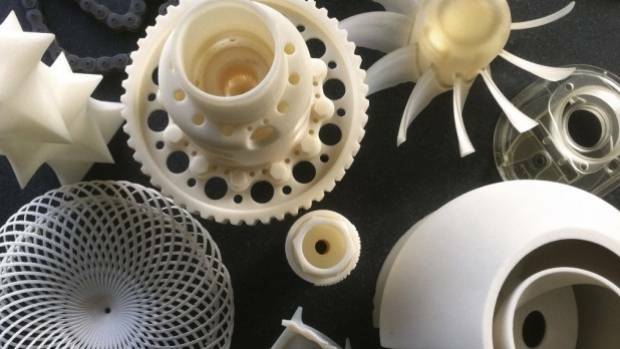 3D printing is revolutionizing the way we make things, from buildings and cars to medical devices. But that’s not all: Many forward-thinking designers in the fashion industry are using 3D printers to cut down on material waste and explore new possibilities for unique and exciting designs. Read on to learn about some of the most advanced 3D-printed clothes and wearables that they’ve cooked up. When considering that nearly everybody carries a smartphone these days – in addition to their keys and wallet – it makes perfect sense why so many designers and manufacturers have been actively designing accessories ranging from speakers and cases to stands and sleeves for the mobile devices. However, the one problem that everybody runs into is also among one of the most difficult to solve: battery life. Inspired by the need to create a portable, on-the-go power solution for smartphone users that doesn’t involve carrying bulky cases or powerpacks, designers Doug Stokes and Chris Tait of Design on Impulse in the UK recently created what they are calling “The World’s Smallest Phone Charger” – AKA “The Nipper”. Consisting of two AA batteries and a magnet that reside on a user’s keyring (the batteries are only installed when in use), the 10 gram Nipper is capable of charging smartphones while users are out and about or perhaps most importantly – during an emergency situation. “The Nipper was primarily designed for emergency use,” explain the designers. The design of the Nipper contains 3 neodynium magnets that are responsible for both making an electrical connection to the circuit board as well as holding the batteries together. According to the designers, the circuit is actually a “boost converter” that converts the power from the batteries into a 5v power supply to charge your phone. For today’s modern smartphones, this means that the batteries can supply an additional 10% battery capacity in 30 minutes, and 20% in just over an hour. Like so many other hardware developers today, Stokes and Tait turned to 3D printing to make their idea for the World’s Smallest Phone Charger real – and have put the concept on Kickstarter to help it gain some traction; already, the campaign has surpassed their $10K goal by more than $3K and it has three weeks left to go. “If we’re making small volumes of Nippers, we’ll 3D print the cases out of high quality nylon, but if demand is high and we have to make a full Nipper army we’re going to injection mold the cases out of polypropylene,” says the designers. While the concept is certainly impressive, the fact that Tait and Stokes just graduated school together and entered a national design competition to develop The Nipper makes the story all the more impressive. “One moment we were doing our finals and the next we were in the centre of London, working on a product we’d come up with in our flat which we’d been given support to make into a reality,” said Stokes. Considering that the device comes in a number of colors and will likely expand to include multiple strap options, the charger is likely to fit with anybody’s style similar to modern smartphone case designs. For those interested, a ‘Classic Nipper’ can be purchased starting at just $23 over on Kickstarter. I say this as both a firearm enthusiast and an advocate for strong firearm regulation. It is becoming evident that there is a point when we as a society are just going to have to accept that 3D printed weapons are not going to disappear behind walls of legislation. 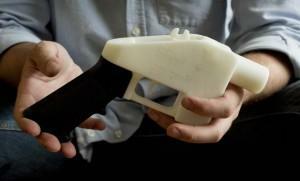 Will that point be when entire guns can easily be 3D printed and constructed at home? Because it is pretty evident at this point that 3D printable firearms will be here soon, and both sides of the controversial issue are going to have to stop chipping away at each other’s platforms and start a real conversation about what kind of society we will have when they get here. At this point, we have all heard of the Liberator created by Cody Wilson, the original 3D printed handgun that got gun nuts overly excited and anti-gun nuts wildly up in arms. For those of us in the middle, realistically the Liberator is a single shot firearm completely made of plastic and is probably not much of a real threat to anyone. And I don’t believe that even with subsequent upgrades and redesigns that have turned it into a much more reliable and dependable firearm, that has really changed. 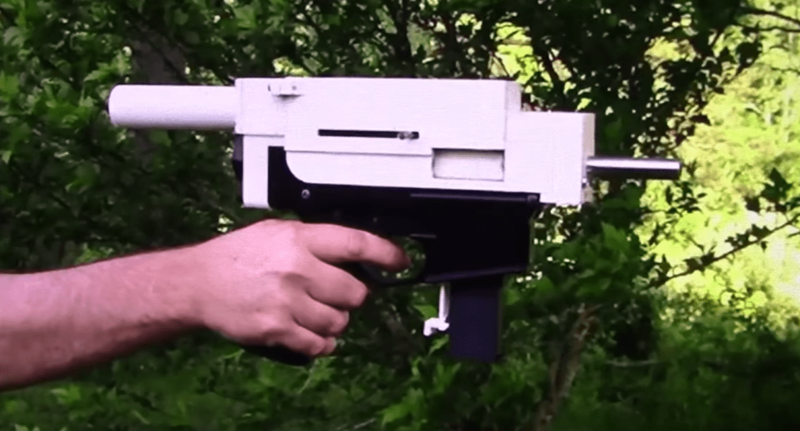 But firearms enthusiasts with 3D printers obviously weren’t going to stop with the Liberator, and they have turned to designing hybrid firearms made of 3D printed parts combined with more durable parts culled from traditionally manufactured guns. One of the most sophisticated and impressive hybrid designs out there is the Shuty, a 9mm semiauto based on a combination of parts from a standard AR-15 and the homemade firearm designs of P.A. Luty. The design for the Shuty combines a metal bolt, an AR fire-control group and the barrel of a Glock combined with a 3D printed bolt carrier, upper and lower receivers and even a 3D printed magazine. The 3D printed parts are all made from standard PLA printed on an Orion from SeeMeCNC. The design intentionally combines metal parts that will be exposed to repeated use with its printed parts that will encounter less wear and tear. With so many plastic parts the Shuty is obviously going to have a rather short period of usability, but because of the clever mixing of metal and printed parts it will be far longer than the one-and-done Liberator. One of the fears of those in favor of banning 3D printed guns is that they might be used in crimes, mass shootings or even for political assassinations. Anyone who has used or 3D printed a gun, regardless of their stance on the issue, is going to be able to tell you with some authority that that isn’t a fear that is based in reality. In terms of actual, practical usability the Shuty really isn’t going to score many points there, especially with no stock or sights. It also looks like a brick, and isn’t going to be comfortably or surreptitiously tucked into any waistbands without looking like an idiot. But while the Shuty isn’t the prettiest gun on the block, it is certainly a cleverly designed one, and most importantly not only does it work, but it actually works pretty well. But it is still a work in progress, so it will undoubtedly be improved with each new iteration. So while right now 3D printed guns are probably the last firearm anyone would choose when planning to commit a crime, that is likely to change at some point. Especially as more advanced 3D printing materials far stronger than standard PLA become available. However, as Derwood says in the description of one of his test videos, at this point the Shuty “is now functioning perfect” and certainly looks intimidating despite its clumsy appearance. If the plastic parts are replaced with more durable and advanced 3D printing materials then it could become a little more of a threat. And even now it is an excellent example of a homemade firearm proof of concept. Gun control advocates insist that eliminating guns in the United States would save lives and reduce (our already record low) crime rates, and they have the Facebook memes about gun availability in European countries to prove it. But you simply can’t erase the last 200 years of our history and culture, and those same European countries don’t have the right to own firearms written into their constitutions. Not to mention the fact that there are an estimated 8.8 guns for each 10 people in the country, so even banning guns isn’t going to result in a gun shortage. They’re going to have to understand that guns aren’t going away, and neither is the culture that surrounds them. But firearms enthusiasts and gun owners are also going to have to face up to some hard realities. They can quote the second amendment all that they want, while trying to pretend that the words “well regulated” aren’t in it, but it simply does not mean all or nothing no matter how much you want it to. The Supreme Court has already ruled that regulation doesn’t violate the Constitution, and because of the fragmented nature of our country, each state sets its own gun laws that are often wildly out of sync with each other. Rather than fighting the inevitability of gun regulation, the smarter move is to implement sane, logical and effective legislation that preserves gun owners’ rights but puts a system in place to help prevent those who would misuse them from getting their hands on them. As much as both sides of the gun debate, as well as the 3D printed gun issue, want their problems with it to go away, that simply isn’t going to happen. The fact that both sides can be less than mature when responding to the opinions of the other certainly isn’t helping settle the issue either. (As I can attest with the hate mail from both sides that I often receive after I write anything on the issue.) Ultimately, some things are going to have to change with the way that we debate and discuss the politics of firearm ownership, especially as it relates to the 3D printing industry. If we don’t, then history has taught us that the option for us to debate the issue is going to be replaced with poorly thought-out laws rammed through Congress. How long until laws are passed requiring manufacturers to include blocks for 3D printed firearm parts? The fact that it is almost un-implementable wouldn’t alter the fact that it has already happened with other technologies. 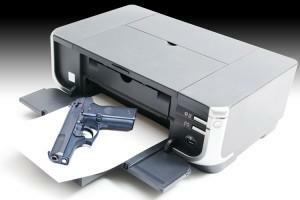 And beyond guns, I’m extremely uncomfortable with the law regulating what someone can and cannot print on their printer. It isn’t as far a leap from preventing the printing of gun parts to preventing materials considered obscene, or preventing trademarked materials from being printed at home. 3D printing is still highly emergent technology that, while opening entirely new possibilities, is still struggling to find its proper place in our world. Things rarely go well when governments step in to regulate technology that they don’t understand. Let us know what you think of the 3D printed firearm issue (or call me a pinko scum or a fascist or a micro-penised gun nut, depending on your political ideology) over on our Shuty 3D Printed 9mm Pistol forum thread at 3DPB.com. When 3D printing really began catching on among at-home users about 2 years ago, it was fairly common to see various designs for figurines, most of which were not very poseable or articulated. Over the past year or so though, we’ve begun to see designers start coming up with ways to make more articulated figures, figures which feature several movable parts. 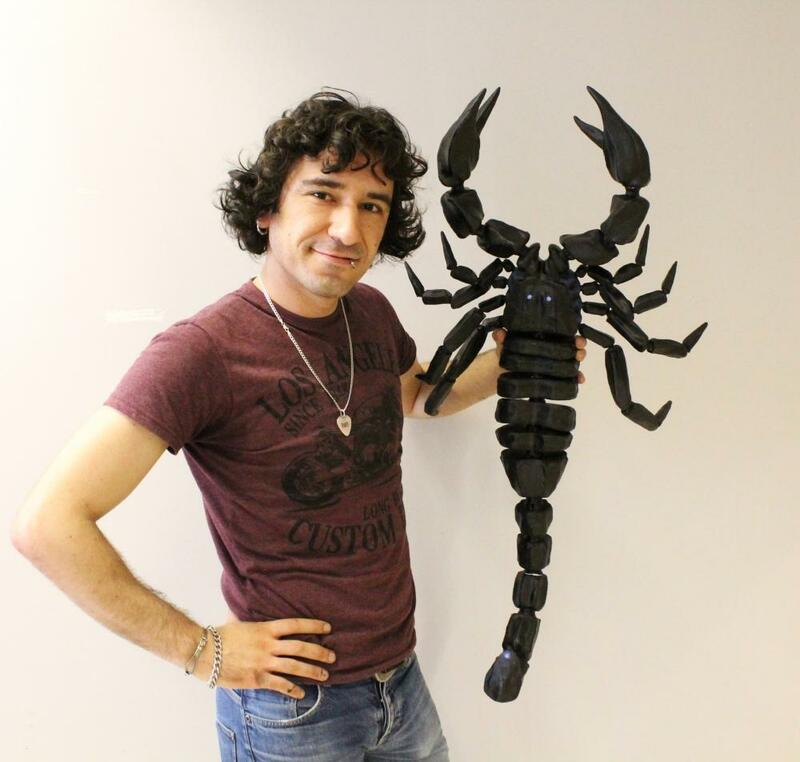 For one 25-year-old Greek designer, named Vasileios Katsanis, moving to London presented him with an opportunity to use his creative ability to fabricate unique 3D printable objects when he joined the MyMiniFactory Academy. And that is exactly what he ended up doing. 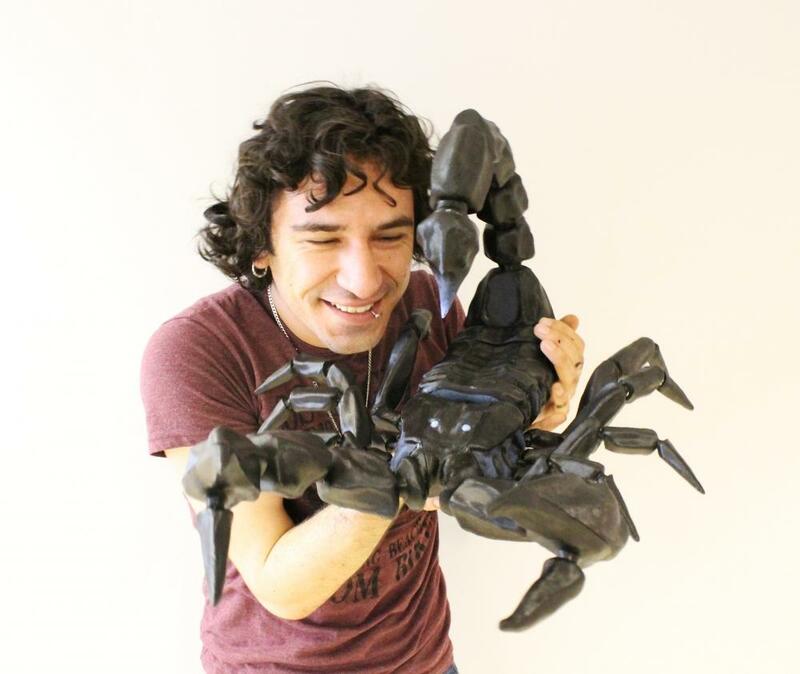 Katsanis didn’t just create any 3D printed posable creature though, he took it to the extreme with a very unique, and very large 3D printed scorpion. It consists of 53 parts, and measures 110cm x 40cm x 60cm in size. Katsanis’ scorpion was modeled in Zbrush, and then he used Rhino to split it into the 53 individual parts. Then joints were added, which he downloaded the design for from MyMiniFactory. The joints all had to be resized to fit the various body parts of the scorpion. Instead of adding all of the joints vertically, Katsanis instead had to angle them to different degreess in order to ensure that they moved in a similar fashion to how a real scorpion does. 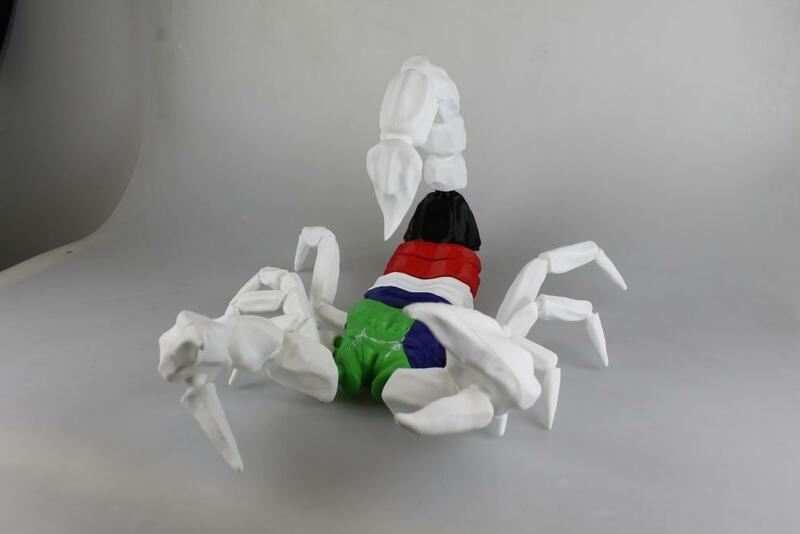 The head of the scorpion is split into 6 parts and the upper claws into 2, in order to avoid the need for any support material going into the joints. The parts were glued together once printed on his Dremel Idea Builder 3D Printer. In all, the 53 parts took approximately 35 hours to print out. 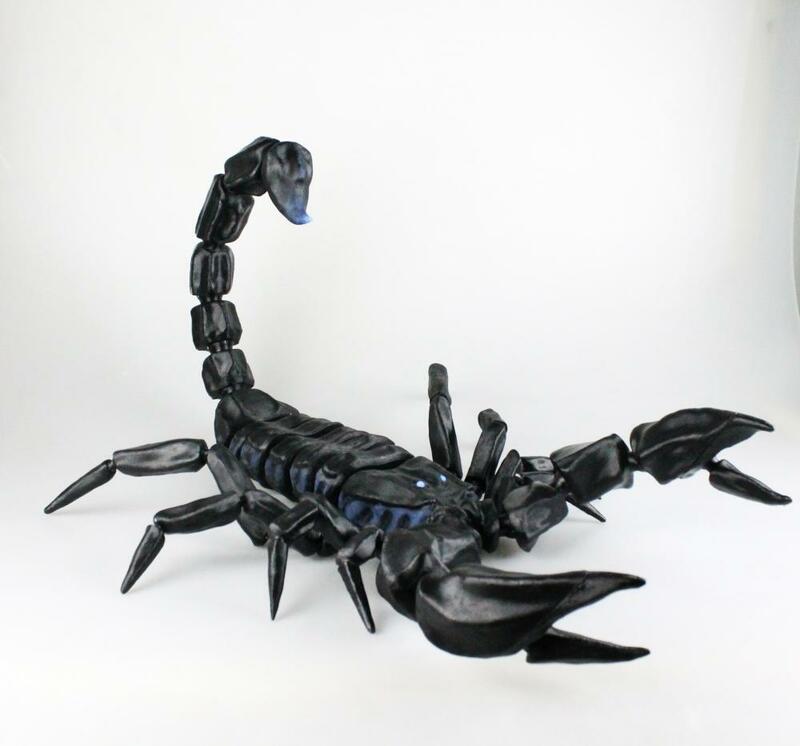 After fully printing it out and assembling it Katsanis proceeded to paint his creature all black with a grayish blue color on its sides, the stinger and the eyes. Katsanis has made the design files for his scorpion available for anyone to download and 3D print free of charge on MyMiniFactory. Due to the successes of the ever expanding maker revolution, it’s becoming more and more evident that 3D printers and basic programming need to be integrated into schools to prepare children for their future. Its therefore fantastic to see that children are already picking up making themselves. Just look at the eight-year-old aspiring programmer and maker Omkar Govil-Nair, who has already developed his very own 3D printed O Watch smartwatch and plans to make it available everywhere through a crowdfunding campaign. Now we sometimes come across inspiring children who are so quickly and easily taking up programming and 3D printing, but few are as successful as Omkar. Like most eight-year-olds, he will be starting fourth grade this year and loves Star Wars, James Bond and badminton. But unlike most, he also loves working with Arduinos and 3D printing. ‘I got interested in electronics and programming 3 years back when I attended my 2nd Maker Faire. I was inspired by Quin Etnyre then the 12 year old CEO of Qtechknow. Since then I wanted to make my own product,’ he explains about his fascination. But more than doing just a bit of tinkering, he has actually developed this cool-looking O Watch, an Arduino-based programmable smartwatch that is intended to give kids a bit of experience with programming and 3D design. Planning to bring this cool watch to market, it will come with a complete set of components that can be used to build the watch yourself and customize it with 3D printed cases and colorful straps. As he goes on to explain, the O Watch is essentially an Arduino IDE build intended for basic use through four buttons. ‘You can program it using Arduino IDE. You can program it to function as a watch with date and time functions from Arduino, you can make games and apps and with the sensor board model you can also measure temperature, humidity, pressure as well as make a compass,’ he says. An integrated color OLED screen and a LiPo batter finishes the kit. One example that the boy already made is a rock-paper-scissors app, illustrating that it is a perfect option for learning some basic programming. What’s more, Omkar did a lot of the work himself and the rest with the help from his dad. ‘I started learning 3D design using Sketchup about 6 months back with help from my dad and Sketchup video tutorials,’ he explains. They then started designs for a case about five months ago, with an eye on the Bay Area Maker Faire. ‘We tried several designs and printed many versions before we got the basic working model we used for the Maker Faire in May. After that we further improved it a bit to make the edges rounded,’ he explains. All 3D printed parts were completed on a Printrbot Simple Metal and in PLA, with a case taking anywhere between twenty and forty-five minutes to 3D print depending on the settings used. This fun and impressive watch looks perfect for educational purposes, so it’s fantastic to hear that Omkar and his dad are also planning a crowdfunding campaign, which is set to launch later this month. The specific goal will be to raise funds for further improving designs and developing templates that can be easily used by children for customization and 3D printing options. The father and son duo are also aiming to develop two kits: one with the basic O Watch, and the second with an additional sensor board with a wide range of sensors for more build options. In short, plenty to keep an eye on. You can find the O Watch website here. 3Dvarius debuts – check it! French violinist spent years designing futuristic, minimalist instrument. A Stradivarius violin is considered one of the world’s most coveted classical instruments, but amateur musicians could soon be jamming on homemade Strads. French violinist Laurent Bernadac has unveiled 3Dvarius, billed as the first fully playable 3D-printed violin. The translucent creation is inspired by the much-coveted instruments created by Italian master Antonio Stradivari in his legendary Cremona shop in the 17th century. However, the design was then stripped down to be as lightweight as possible and allow for extreme freedom of movement for contemporary musicians. The 3Dvarius is essentially an electric violin and uses a magnetic pickup to detect the vibrations made by the strings and must be plugged into an amplifier. 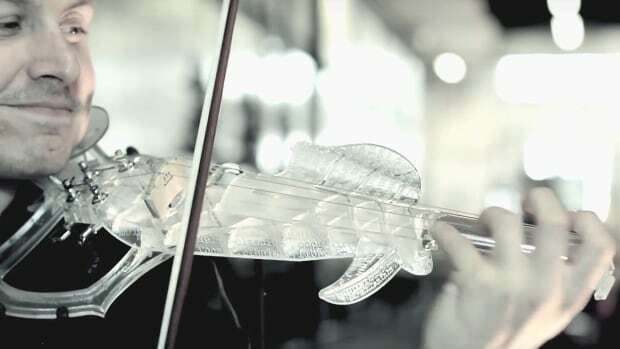 Produced as a single piece using stereolithography – a 3D technology that prints models one layer at a time by rapidly curing a liquid polymer using UV lasers – the model had to be strong enough to withstand the tension and pressure of violin strings, which also have to be tuneable. Bernadac revealed one of the first successful prototypes, nicknamed Pauline, in videos released this month. The musician, whose high-energy performances blend the traditionally classical instrument with guitar, the cajon percussion box and other sounds, has spent the past few years designing the futuristic-looking 3Dvarius. A California automotive start-up is hoping their prototype supercar will redefine car manufacturing. The sleek race car dubbed ‘Blade’ didn’t come off an assembly line – but out of a 3D printer. Kevin Czinger of Divergent Microfactories has spent most of his career in the automotive industry. One day he realized that no matter how fuel-efficient or how few tailpipe emissions the modern car has, the business of car manufacturing is destroying the environment. “3D printing of metal radically changes that. By looking at 3D printing not for that overall structure but to create individual modular structures that can be combined, that 3D printing transforms everything,” said Czinger during an interview with Reuters in Silicon Valley. According to Czinger, 3D printing transforms everything by changing the way the structural components of cars are fabricated. Currently cars are pieced together on long assembly lines inside large factories that use massive amounts of energy. Even the most fuel-efficient car has a large carbon footprint before ever leaving the plant. Czinger and his team’s approach was to take the large plant out of the equation. To accomplish this they printed the modular pieces that are used to connect carbon rods that make up the Blade’s chassis. “The 3D printed chassis is only 102 pounds and has the same strength and safety protection as a frame made out of steel,” said Brad Balzer, the lead designer on the project. By using carbon fiber instead of steel or aluminum for the body, the entire vehicle only weighs 1400 pounds (635kg), giving it twice the weight to horsepower ratio of a Bugatti Veyron. The Blade is fitted with a 700 horse power engine that runs on natural gas, reducing its carbon footprint even further. Balzer says designing an eco-friendly speed demon supercar as their first prototype was intentional. “We focused a lot on the aesthetics of this car because it is very important to capture the people’s imaginations, especially when we are talking about the core enabling technologies,” he said. The core enabling technology, the ability to print out car components that can be easily assembled, is what Kevin Czinger hopes will revolutionize car manufacturing. He says electric cars are a step in the right direction, but alone they won’t be enough to curb greenhouse emissions given the projected rise in demand for cars globally unless the way they are manufactured changes. “By constructing a car this way it has less than one third of the environmental and health impact than the 85 hours all electric car for example has,” he added. Czinger and Balzer are starting small but they believe their new 3D printing method for car manufacturing will have a huge impact on how the cars of the future are built. I’m going to put this as gently as possible: 3D printing entire buildings, right down to the fixtures, doesn’t make a ton of sense yet. The group’s designs get rid of any redundant materials in a beam. With smart software modeling, they say they’re able to cut down on the amount of CO2 produced by a structural beam by 50 percent. 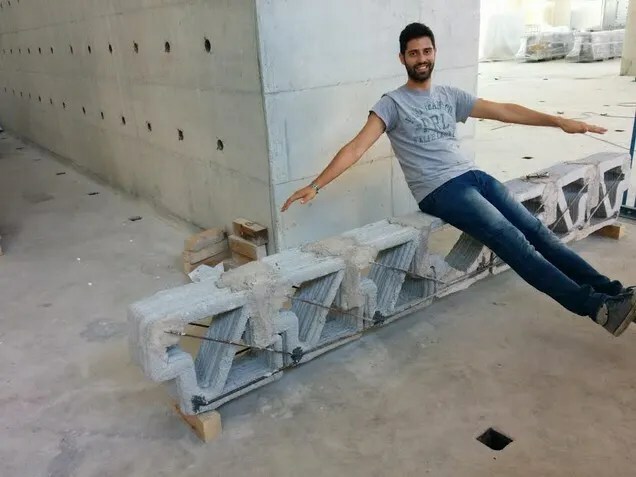 The product of their research was unveiled today, and they describe it as “the world’s first 3D printed reinforced beam,” though other groups have certainly been pursuing similar ideas. The fact that it’s lighter and less expensive isn’t the most important thing about the design—it’s the fact that is uses less concrete. Concrete is the most-used artificial material on Earth, as Gizmodo’s Maddie Stone wrote yesterday, and it’s now a $100 billion market. In countries that are developing cities very rapidly, it’s the singular building block: One popular stat, for example, holds that China has used more concrete in the past three years than the US did in the entire 20th century. And unfortunately, making the stuff contributes to as much as 7 percent of global CO2 emissions. While printing full houses also has the potential to cut back on waste, by using construction refuse for “ink,” for example, the technology is still too nascent to be used widely anytime soon, or in any structure besides simplistic one-story homes. 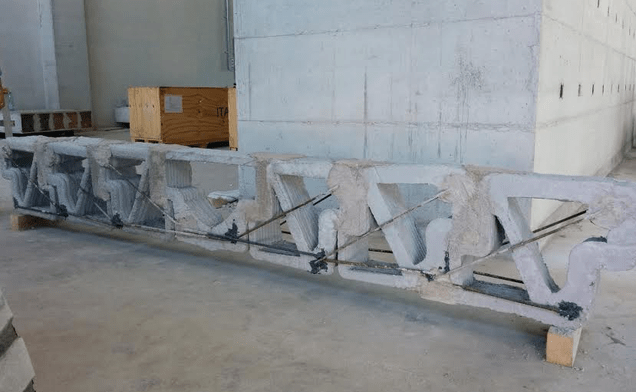 WASP’s beam, on the other hand, is already being stress-tested at the University of Naples’ engineering lab. One day, it could be integrated into conventional structures and skyscrapers, without the architects or developers needing to design a fully printed building. It’s still a long ways from being adopted by the industry—this is still just an experiment. But it’s far less of a pipe dream than a full 3D-printed house. You might be waiting on that for a while.